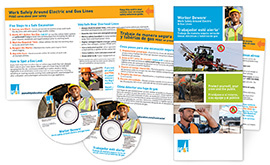 To help you teach employees how to work safely around electrical and natural gas lines, we’re pleased to offer you a FREE safety training kit. How to Order: Simply click the Order button below and complete the online order form. Orders are filled on a first-come, first-served basis. Please allow 2-4 weeks for delivery. These brochures contain concise information and bold photos that illustrate key safety tips regarding overhead lines and underground utilities. These English/Spanish visor cards are kept in your vehicle as a quick reference for preventing accidents around power lines on the job site. It covers how to work safely around overhead and underground lines, and what to do in the event of a power line contact. Slide Show: This presentation is designed to enhance your safety meeting by introducing basic safety information to participants before viewing the video. It includes talking points to assist you with each slide. Trainer’s Guide: This comprehensive guide addresses everything you need to run an effective safety training session, such as learning preferences, room set-up tips, presenter’s notes and ideas for discussion and activities.